Group psychotherapy or group therapy is a form of psychotherapy in which one or more therapists treat a small group of clients together as a group. The term can legitimately refer to any form of psychotherapy when delivered in a group format, including cognitive behavioural therapy or interpersonal therapy, but it is usually applied to psychodynamic group therapy where the group context and group process is explicitly utilised as a mechanism of change by developing, exploring and examining interpersonal relationships within the group. 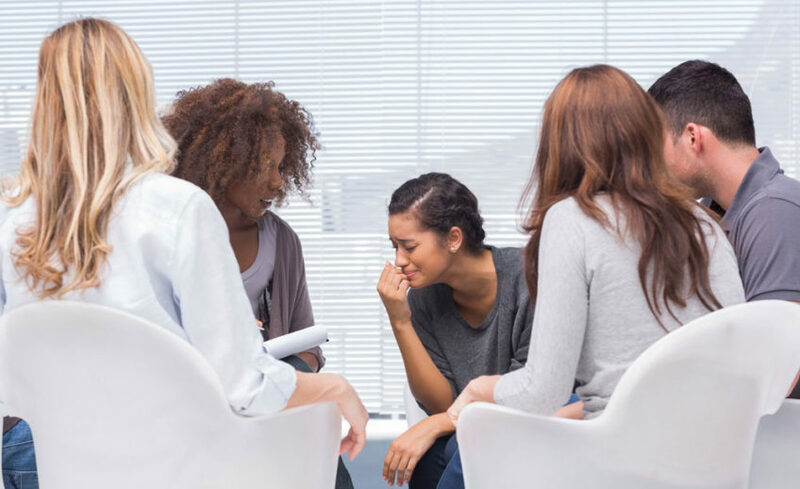 The broader concept of group therapy can be taken to include any helping process that takes place in a group, including support groups, skills training groups (such as anger management, mindfulness, relaxation training or social skills training), and psychoeducation groups. The differences between psychodynamic groups, activity groups, support groups, problem-solving and psycoeducational groups have been discussed by psychiatrist Charles Montgomery. Other, more specialised forms of group therapy would include non-verbal expressive therapies such as art therapy, dance therapy, or music therapy. Irvin Yalom proposed a number of therapeutic factors (originally termed curative factors but renamed therapeutic factors in the 5th edition of The Theory and Practice of Group Psychotherapy). The group is a place where members can help each other, and the experience of being able to give something to another person can lift the member’s self esteem and help develop more adaptive coping styles and interpersonal skills. In a mixed group that has members at various stages of development or recovery, a member can be inspired and encouraged by another member who has overcome the problems with which they are still struggling. While this is not strictly speaking a psychotherapeutic process, members often report that it has been very helpful to learn factual information from other members in the group. For example, about their treatment or about access to services. Members often unconsciously identify the group therapist and other group members with their own parents and siblings in a process that is a form of transference specific to group psychotherapy. The therapist’s interpretations can help group members gain understanding of the impact of childhood experiences on their personality, and they may learn to avoid unconsciously repeating unhelpful past interactive patterns in present-day relationships. One way in which group members can develop social skills is through a modeling process, observing and imitating the therapist and other group members. For example, sharing personal feelings, showing concern, and supporting others. It has been suggested that this is the primary therapeutic factor from which all others flow. Humans are herd animals with an instinctive need to belong to groups, and personal development can only take place in an interpersonal context. A cohesive group is one in which all members feel a sense of belonging, acceptance, and validation. Learning that one has to take responsibility for one’s own life and the consequences of one’s decisions. Catharsis is the experience of relief from emotional distress through the free and uninhibited expression of emotion. When members tell their story to a supportive audience, they can obtain relief from chronic feelings of shame and guilt. Group members achieve a greater level of self-awareness through the process of interacting with others in the group, who give feedback on the member’s behaviour and impact on others. This factor overlaps with interpersonal learning but refers to the achievement of greater levels of insight into the genesis of one’s problems and the unconscious motivations that underlie one’s behaviour.